Pharma Marketing Blog: Pfizer's Centrum Will No Longer Claim It Aids "Breast Health" and "Colon Health"
Pfizer's Centrum Will No Longer Claim It Aids "Breast Health" and "Colon Health"
As reported by Reuters (here) "Pfizer, bowing to allegations of deceptive advertising lodged by a consumer watchdog group, has agreed to drop 'breast health' and 'colon health' claims from the labels of its widely used Centrum multivitamin supplements." "Watchdog groups such as CSPI have taken the lead in recent years in policing the accuracy of supplements' health claims amid widespread criticism that the U.S. Food and Drug Administration is not doing enough to help consumers navigate conflicting information," said Reuters. "The Government Accountability Office has also said the FDA needs more power to regulate supplements." 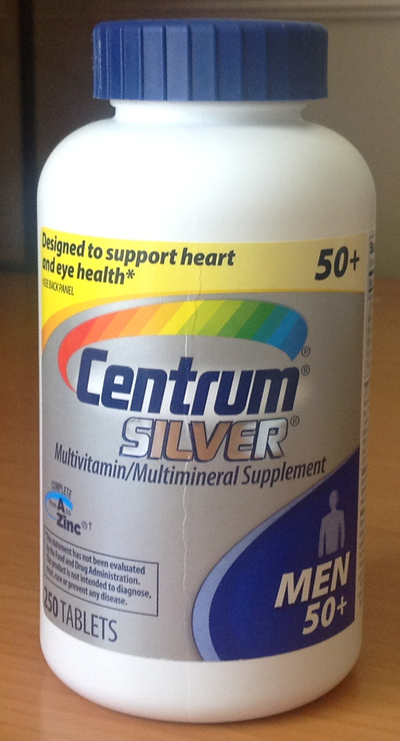 On labels and advertising for Centrum products that bear a claim for "heart health" [see photo on left], Pfizer Consumer Healthcare will add clarifying language that the products are "not a replacement for cholesterol-lowering drugs," said CSPI (see "Pfizer Consumer Healthcare, CSPI Resolve Centrum Labeling Issues"). "For many consumers, a daily multivitamin is an inexpensive insurance policy to make sure that one's getting the recommended daily amounts of important vitamins and minerals," said CSPI litigation director Steve Gardner. "But supplement manufacturers must not mislead consumers into thinking that these pills will help ward off cancer." I guess Pfizer has to take Centrum off its list of "innovative" drugs it develops/markets for the treatment of cancer!